Dallas, TX. The Ed Price Collection, an incomparable variety collection of early Dimes and Quarter Eagles, valued over $4 million, will be auctioned by Heritage Auction Galleries at their Official Auction of the Baltimore ANA, July 30-Aug. 2, 2008. 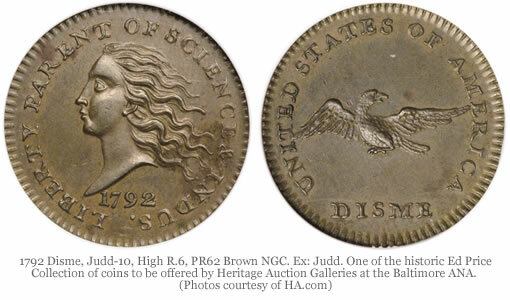 Only one complete collection of draped bust dimes by variety had previously been assembled (Allen F. Lovejoy’s, sold in 1990), and only one complete collection of early quarter eagles (1796-1807) by variety had previously been assembled (by Harry Bass – now on display at ANA Museum). Heritage is proud to present the Ed Price Collection, a complete collection by variety of both the early dimes and quarter eagles, featuring the common reverse dies, such as has never before been assembled. Ed Price has collected coins since about 1950, when he was eight years old, and like most young collectors, he focused on circulating modern series. After graduation from Yale in 1964, he began to pursue more important coins, and by 1970 he started collecting U.S. type coins. Mr. Price sold most of his type collection in 1988 and began focusing on early Federal coinage; after a decade long search, he had assembled and sold a complete collection of half dime varieties from 1794 through 1805 (and discovered the new variety, 1800 LM-4, in the process). Mr. Price’s 1796 JR-7 and 1803 JR-5 dimes included herewith are also discovery coins. Mr. Price’s interest in early dimes continued. At the 1990 Lovejoy sale, he bought his 1802 JR-1, still the only known example. Later he purchased the Draped Bust Dime Collection of noted numismatic author Bill Subjack intact. He continued to upgrade his coins with the help of dealer Stu Levine, and ultimately discovered the new variety 1803 JR-5. Almost all of the dimes are in the Condition Census and many are the finest known. Inspired by Subjack and intrigued by the common reverse dies, he simultaneously pursued and completed a collection of early quarter eagles. For information about consigning to Heritage’s Official Auction at the Baltimore ANA, please contact the Consignor Hotline at 800-872-6467 ext. 1000.